I love to cook. There’s nothing better than preparing a great meal for my family, and watching the delight on their faces as they chow down. Naturally, that passion is something that I want to share with my children. I imagine that’s why play food sets have been so popular over the years. They allow parents to play with their kids, while introducing them to the benefits of cooking. I see them as a gateway to the real thing. Play food sets also make it easy for your children to share the fun with other kids. They’re versatile toys that encourage sharing, touch, and general learning. Of course, you have to pick a suitable play food set or else your child won’t get any enjoyment out of it. There are loads available, and I struggled to choose the sets that were right for my kids at first. However, using my own experiences, as well as those from other parents, I’ve come up with a list of ten play food sets that may be great for your child. I like Melissa & Doug’s food set because it puts an interesting spin on the original concept. Instead of offering a bunch of plastic foods, it has foods from the main five food groups. So, you can use the set to teach your child about the importance of proper nutrition. The set comes with four wooden crates, into which your child can stack food items. You get cereals, eggs, fish, and a host of other foods that children over the age of three should be familiar with. ​Melissa & Doug have used wood to create each piece, which makes this set pretty sturdy. You also don’t have to worry about the possibility of toxic plastic materials, such as Bisphenol A (BPA) or polyvinyl chloride (PVC) coming into contact with your child’s skin. 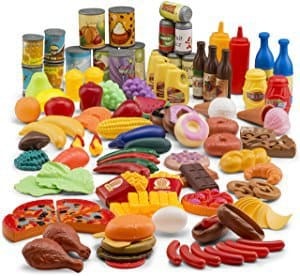 I also like how you can combine it with other play food sets. What's Great About It: The use of wood may make this one of the sturdier play food sets around. I also like the focus on the five food groups, as this makes it a useful teaching tool. Naturally, any set that’s free of toxins gets bonus points. Variety is the spice of life with this huge play food set. 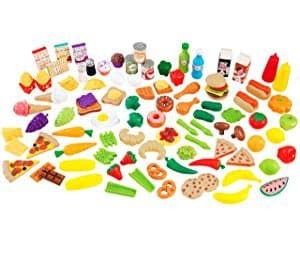 It comes with 122 pieces, which range from simple fruit and vegetables, through to condiments and cans of food. You essentially receive the contents of your average kitchen, which gives you child plenty to play with. JaxoJoy uses BPA-free plastics for all of the food items. Not only that, but they’re surprisingly durable, plus they’re easy to wipe clean. 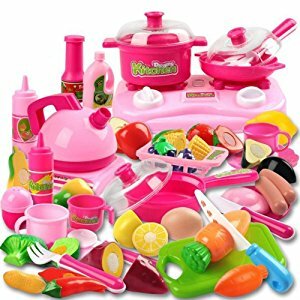 The striking colors catch the eye, and there are so many items here that your child will be able to imitate almost anything that you do in the kitchen. The only thing I’m unsure about is the junk food in the set: cartons of fries, burgers, and donuts. But you can always remove these items before giving the set to your child. What's Great About It: There’s so much variety in this set that you may never need to buy another play food set. I also like the use of safe plastics, plus you can clean the items easily after use. Like JaxoJoy’s set, KidKraft’s play food set has a lot of pieces: 115 in total, so there’s plenty of variety thrown into the mix. I like how there are only two pieces of each item, as this means you receive about 60 types of food in all. The set comes in a sturdy storage box, which makes it a great gift. I also like the size of the pieces. Though they’re recommended for ages three and up, I don’t think there’s any risk of choking for younger children. KidKraft has used plastic to make the foods, but I can’t find any information about the type of plastic. Unfortunately, this means I can’t confirm whether it’s BPA-free, so keep that in mind if you’re worried about toxic plastics. What's Great About It: There are loads of pieces in the set, plus you can combine them with KidKraft’s kitchen toys. You don’t have to assemble anything, and the storage box makes this easy to give as a gift. I think the Magical Oven may be one of the best play food sets for teaching your children the basics of cooking. 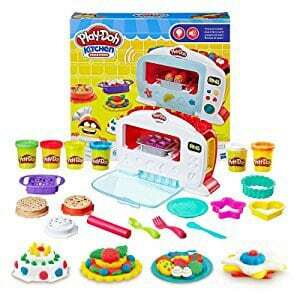 It comes with the titular oven, six pots of Play-Doh, and several accessories that your child can use to shape the Play-Doh into various food items. The oven makes this set stand out. It has a simple lever, which activates the oven. The light changes to red to show your child that the oven is active, plus there’s a little “ding” sound that plays when the “baking” ends. It’s all very realistic, making it a great teaching tool. The set also comes with some instructions, which you can use to teach your child how to make different foods. I do recommend watching your child playing with this set, as Play-Doh seems to have a habit of finding its way into little mouths. Also, bear in mind that the oven needs three AAA batteries to work, and these aren’t included in the set. What's Great About It: The oven is a superb teaching tool, and you can use the accessories to teach your child about the basics of preparing food. The Play-Doh also allows your child to get their creative juices flowing. 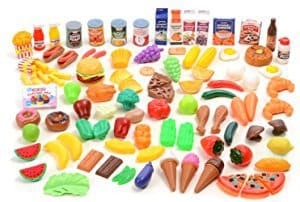 Another huge food set, Kangaroo Deluxe offers 120 pieces in its collection. While you get plenty of variety, there is one aspect of this set that I think sets it apart. Some of the foods carry an “organic” label, which opens up the opportunity to teach your child about the benefits of organic foods. They’re lightweight too, which makes them great for toddlers who’ve just discovered the joys of throwing things about. You won’t have to worry about your toddler hurting themselves through vigorous play. This may be one of the better sets for parents who are concerned about toxic products, as each item is BPA-free. However, Kangaroo Deluxe has used paper for the packaging of the boxed items, which makes them less durable than I’d like. There’s also a chance that your child will tear this paper off and eat it. What's Great About It: The BPA-free plastics are very light, so you won’t have to worry about your toddler hurting themselves with the items. There’s also lots of variety, and I like the focus on organic products. This may be one of the more versatile play food sets available. You receive dozens of plastic foods, all of which are BPA-free. But it’s the accessories that make this one of the most inspired sets around. It comes with four stainless steel pots and pans, four other steel accessories, and a small apron. Your children can use the pots and pans to emulate the way that you cook. Of course, steel is quite heavy, so you need to keep an eye on your child just to make sure that they don’t start swinging the pans around. I also like the box that comes with the set. It folds in several ways so you can create a quick cooking surface or kitchen sink for your child. This is great if you don’t want to buy a full kitchen set. What's Great About It: The reusable box is a brilliant idea that I think more play sets should include. The pots and pans make your child feel like they’re really cooking, plus all of the foods are made with safe plastics. 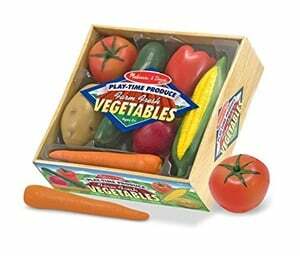 Melissa & Doug return with another durable play food set. This one focuses on baking cookies, and contains everything your little one could need to become a miniature baker. Along with 12 cookies and toppings, you also receive a baking tray, slicer, and oven mitt. I particularly like the dough tube, which gives you somewhere to store the cookies when they’re not in use. Unfortunately, the set does lack variety. 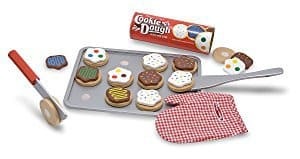 Your child only gets cookies to play with, which means this may serve better as an addition to an existing play food set, rather than as a standalone toy. What's Great About It: The wooden items are durable and quite easy to clean. I like the accessories too, as they allow you to use the set as a primer for how to bake cookies before you introduce your little one to the real thing. It may not have the most pieces, but I like Kimicare’s set because it focuses mostly on healthy foods. The only junk food you’ll see is the pizza. Everything else is fruit, vegetables, and healthy meats. The set comes with a plastic chopping board and knife that are safe and easy to use. Apart from being fun, these can also teach basic hand-eye coordination. The backpack also makes this one of the best choices for kids who want to take their play sets to a friend’s house. It also offers a handy place to store the set once your child is done playing. What's Great About It: The Kimicare play food set may be one of the better choices for a first-time buyer. It has a nice range of foods, and a couple of accessories. The backpack makes it one of the more portable sets around. Play food sets offer plenty of learning opportunities for your child. You can use them to teach your child about various cooking methods, and the importance of the five major food groups. Younger children will enjoy touching and exploring the food items, plus they can get creative with how they play. I also like how food play sets help kids develop their hand-eye coordination. For example, “chopping” food with a plastic knife encourages your child to slow down and focus on the task at hand. You must think about the set’s purpose before you buy. If your child has a play kitchen already, a set that offers more food items should do the job. 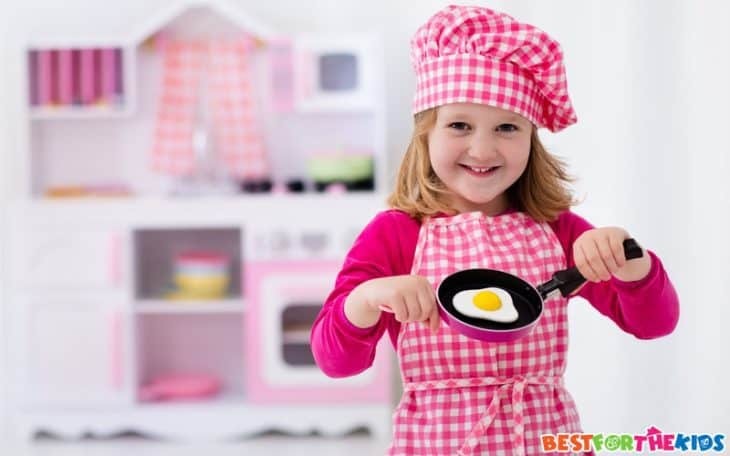 If you’re buying for the first time, you may want something that comes with accessories that allow your child to emulate how you cook in the kitchen. Some sets don’t come with a storage container, which means you could end up with lots of little pieces scattered around the house. Others encourage creativity because they allow your child to create their own foods. Each of these sets offers something different, so consider what will work best for your child. An educational aspect, such as being useful for teaching children about food groups or organic foods. 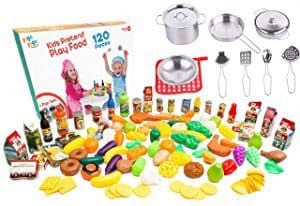 Play food sets provide plenty of educational opportunities to toddlers. They encourage your child to emulate your actions in the kitchen, so you can use them to teach the basics of cooking or the value of good nutrition. They also stimulate creativity. Most of all, they’re fun. Kids can spend hours coming up with all sorts of interesting food combinations. They’ll also develop their coordination skills, and have a toy that I think is great for sharing with their friends. When choosing a play food set, think about the needs of your child. Some sets make for great additions to an existing play kitchen set, whereas others offer something different. Anything that encourages your child to be creative and eat healthily should be a good choice.